Why do people chew gum? If an anthropologist from Mars ever visited a typical supermarket, they'd be confounded by those shelves near the checkout aisle that display dozens of flavored gum options. Chewing without eating seems like such a ridiculous habit, the oral equivalent of running on a treadmill. And yet, people have been chewing gum for thousands of years, ever since the Ancient Greeks began popping wads of mastic tree resin in their mouth to sweeten the breath. Socrates probably chewed gum. It turns out there's an excellent rationale for this long-standing cultural habit: gum is an effective booster of mental performance, conferring all sorts of benefits without any side-effects. 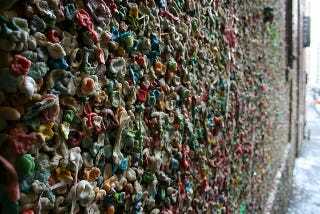 The latest investigation of gum chewing comes from a team of psychologists at St. Lawrence University. The experiment went like this: 159 students were given a battery of demanding cognitive tasks, such as repeating random numbers backwards and solving difficult logic puzzles. Half of the subjects chewed gum (sugar-free and sugar-added) while the other half were given nothing. Here's where things get peculiar: those randomly assigned to the gum-chewing condition significantly outperformed those in the control condition on five out of six tests. (The one exception was verbal fluency, in which subjects were asked to name as many words as possible from a given category, such as "animals".) The sugar content of the gum had no effect on test performance. While previous studies achieved similar results – chewing gum is often a better test aid than caffeine – this latest research investigated the time course of the gum advantage. It turns out to be rather short lived, as gum chewers only showed an increase in performance during the first twenty minutes of testing. After that, they performed identically to non-chewers. What's responsible for this mental boost? Nobody really knows. It doesn't appear to depend on glucose, since sugar-free gum generated the same benefits. Instead, the researchers propose that gum enhances performance due to "mastication-induced arousal." The act of chewing, in other words, wakes us up, ensuring that we are fully focused on the task at hand. Unfortunately, this boost is fleeting. The takeaway of this research is straightforward: When taking a test, save the gum for the hardest part, or for those questions when you feel your focus flagging. The gum will help you concentrate, but the help won't last long. This latest paper only adds to the impressive body of psychological literature on gum. Last month, scientists at Coventry University found that people chewing mint gum showed a dramatic decrease in feelings of sleepiness. The subjects also looked less exhausted when assessed with the Pupillographic Sleepiness Test (PST), which uses the oscillations of the pupils as a metric of tiredness. When we chew gum, we gain alertness and attention, but without the jitters. And then there's this paper, from a researcher at Cardiff University. 133 volunteers were given cognitive tests with and without chewing gum. (They were also randomly assigned gum flavors, treated to a selection of fruits and mints.) Approximately half of the volunteers were tested while listening to a screeching noise – this was the stress condition – while the other volunteers took the test in a quiet room. After each testing session, the volunteers rated their mood and underwent a number of physiological measurements, including heart rate and salivary cortisol levels. (Cortisol is a stress hormone, but it's also a good indicator of alertness.) As expected, gum chewers were more attentive than non-chewers, with elevated heart rates and cortisol levels. They also had much faster reaction times, especially on more difficult reaction tests. They even appeared to be in a better mood. PS. @ResearchDigest points out that another new paper on gum chewing that found chewing decreased performance on tests of short-term memory that involve serial recall. Tapping with the hands achieved the same results, suggesting that the rhythmic pulse of bodily movement might interfere with the memorization of ordered lists.